Handing over the reins and the keys to your castle to a “stranger” called... A Property Manager! 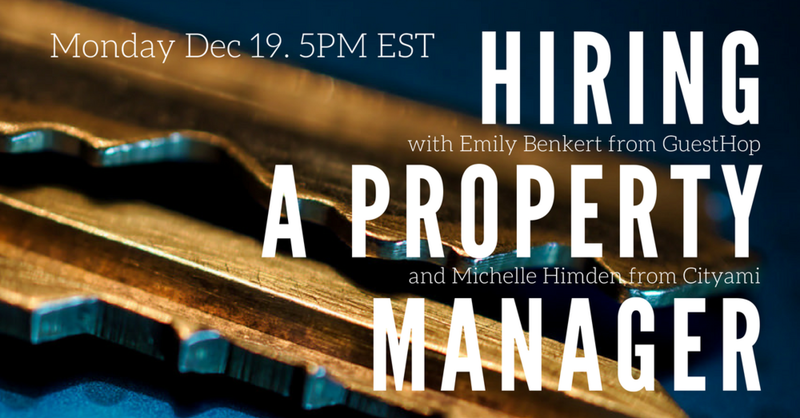 We will discuss how to properly vet and select a Property Manager that fits your hosting style. Hire a Property Manager that will keep your HIGH STANDARDS and maintain your 5-star ratings while you’re out and about, living life! who YOU can trust with YOUR castle. Yes, Castle! Monday, December 19th @ 5pm EST. Is my listing a good fit for a property manager? Will it be worth it, or will it create more stress in the end? How much personal info should I hand over to this "stranger"? How to handle emergencies… ‘Cause (____) happen. How do guests feel about Property Managers? When Evelyn takes the mic even Airbnb co-founder, Brian Chesky, listens! I’m Evelyn Badia, and I have been a successful Airbnb Superhost since 2010. I have hosted 100’s of guests in my home, and I have been an Airbnb Host Educator at the 2015 Airbnb Open in Paris and 2016 Airbnb Open in Los Angeles. I have done more than my share of laundry and renovations, and I pay ALL of my New York City bills with just two listings. Emily is the founder of Guesthop. She was sharing her home and welcoming travelers from all across the globe way before Airbnb existed. What was once a great way to keep her home occupied and paid for while traveling with her kids turned into a passion and a business. With her business management background and extraordinary people skills, Emily has created a unique and highly sought after short-term rental property management company that offers peace of mind to homeowners. Maximize Your Airbnb Experience, and revenue. Let Guesthop Help You be the Best Host possible. Your Airbnb Experience. Let Guesthop Help You. Three years into hosting full time on Airbnb, Michelle realized there was a huge need for help with hosting while away. Turning to her passion for customer experience, hospitality, and travel, paired with her 3 years of hosting guests in her own home - Michelle founded Cityami as a solution for part time hosts. Cityami not only personally handles the essentials like check-in/out and cleaning, but also serves as the guest’s local contact, offering tips on the city and attending to emergencies (like lockouts). So, what are you waiting for? Two PM experts and ME…for FREE!